Universal 8-channel transponder without FEC enables you to build flexible and cost-effective CWDM/DWDM systems. 3R-regeneration of the signal is performed for each channel (reamplification, reshaping, retiming). Tunable SFP+ or “color” SFP/SFP+ with a fixed wavelength can be used on each line port. 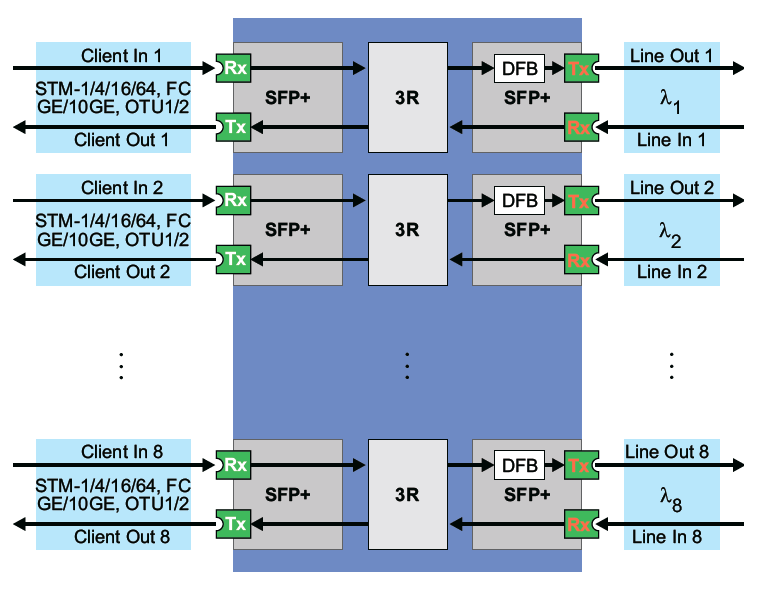 The use of standard SFP+ connectors significantly increases the cost-efficiency of the solution. A wide range of client interfaces with speeds from 155 Mbit/s to 10 Gbit/s enables smooth upgrade of client equipment without a need to change the transponder. The device supports both STM and 1GE/10GE ports that makes it possible to arrange SDH-rings and IP-networks.